OnePlus is rumoured to launch a new variant called OnePlus 7 Pro this year alongside OnePlus 7 in the country. OnePlus 7 Pro will include a pop-up selfie camera, triple rear cameras and Snapdragon 855. Also, OnePlus 7 has been leaked in full revealing the complete design. The sixth generation OnePlus 7 smartphone has been one of the most talk-about smartphones this year. Recently the current OnePlus 6T has been discounted, hinting at an imminent launch of the successor. Technology site Android Pure has leaked a series of pictures rumoured to be the OnePlus 7. The leak images are in line with the previous rumours like pop-up selfie camera and rear triple camera setup. A new leak is out hinting at an all new variant called OnePlus 7 Pro. The company is rumoured to be working on a Pro variant of OnePlus 7, leaked on the Chinese microblogging site, Weibo. The leaked renders show a OnePlus smartphone with almost no bezels on all sides. OnePlus 7 Pro with model number GM1911 is said to be coming to India. OnePlus 7 Pro is said to come with the same pop-up selfie camera, as leaked in pictures. OnePlus 7 Pro will run on Qualcomm’s current flagship chip, Snapdragon 855. OnePlus 7 Pro will come with three cameras at the back, tipped wiith 45MP + 16MP + 8MP camera configuration. OnePlus 7 Pro is said to sport 8GB RAM and 256GB storage running on Android 9 Pie based on the latest Oxygen OS with a 4,000mAh battery backed by Warp fast charging. The series of leaked pictures by Android Pure hint at a all-new design, first for any OnePlus smartphone. The smartphone will come with a full-screen display this time ditching the notch. The company used notches for its last two iterations, first a wide first generation notch on OnePlus 6 and a water drop notch on OnePlus 6T. Interestingly the smartphone has a full panoramic design for OnePlus 7. For the selfie sensor, the smartphone will take in a pop-up sensor. OnePlus 7 will come with a pop-up selfie camera on top for selfies and image recognition. Now as the full design is out, it’s pretty much confirmed that the smartphone will come with the pop-up sensor and triple camera setup at the back. 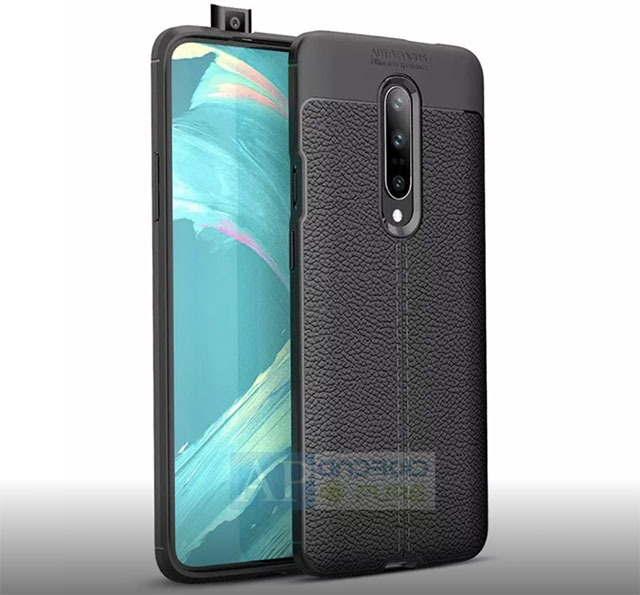 This is in line with the previous OnePlus 7 case renders. The upcoming OnePlus flagship will have a pop-up selfie-camera module on the top. It’s not on the middle, but aligned slightly to the side. Holding it the device, you will have the sensor on the list, not exact left. Coming to the interesting part, OnePlus 7 will come with a triple rear camera set up this time, again a first time feature for a OnePlus smartphone. The triple camera setup will include the Sony IMX 586 48MP sensor as the primary shooter. Up front, the display will probably have more than 90 percent screen-to-body ratio with minimal bezels and quite thin chin down under. The smartphone won’t come with any physical fingerprint scanner. So, the company will again be using the same optical in-display fingerprint scanner from OnePlus 6T. Sadly, there’s no headphone jack again. OnePlus dropped the jack in 6T to make room for an in-display sensor and a slightly larger battery. The upcoming OnePlus smartphone will hit the Indian shores within a day or two after the global launch. The recent discount on OnePlus 6T hints at an imminent launch of the next iteration. Just like its previous generations, OnePlus 7 will launch in May. Coming to OnePlus 7 India price, the base model will be priced at around 40,000 rupees. Recently Xiaomi’s Poco took over OnePlus as the bestselling online smartphone brand for premium smartphones. So, the company may plan to price OnePlus 7 more competitively against the competition. "This Is How Oneplus 7 Looks; OnePlus 7 Pro Will Also Launch At The Same Time! ", 5 out of 5 based on 4 ratings.